As the Baby Boomer generation ages, cases of dementia and Alzheimer’s disease are on the rise. The Alzheimer’s Association estimates that 5.7 million Americans are living with the disease in 2018 and that number is expected to increase every year. People with these conditions experience memory loss and become confused easily, which makes living alone dangerous. They need constant supervision to keep them safe, but this places a severe burden on family members who usually aren’t mentally, physically, or emotionally equipped to provide this level of care. Assisting Hands Home Care provides high quality, compassionate care for clients in Des Plaines, IL who have been diagnosed with Alzheimer’s and other forms of dementia. 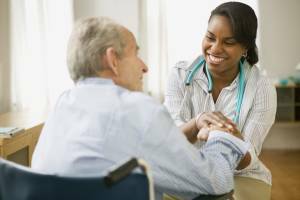 Experts believe that it’s best to care for these patients in their own homes rather than in a nursing home or other facility unless absolutely necessary. This keeps them in surroundings that are familiar, so they feel more comfortable and secure. Our dementia services help clients stay in their own homes safely with the care and supervision they need. Our care coordinators will work with you to create a care plan that meets all your loved one’s needs and we’ll engage them in exercises that will stimulate their brains and improve their memory skills. Forgetfulness. These conditions affect short term memory at first, which make daily tasks difficult and can lead to hazardous conditions. A patient may forget they’re cooking something on the stove and wander off, leaving the food to burn and start a fire. They may also forget to pay bills or eat regularly. Wandering. Everyone has seen news stories of Alzheimer’s patients who have wandered away, often with tragic results. They may be trying to reach some place that’s now hundreds of miles away, or doesn’t exist anymore, like an old home or restaurant. Agitation. Patients with these conditions, especially in the early stages, realize what is happening and feel understandably frustrated and upset. They may lash out physically or verbally, which is devastating to family members. Incontinence. In the later stages of these diseases, patients lose control of their bladder and bowels. They have a great deal of trouble getting to the restroom in time and may not realize what happened. The caring assistants at Assisting Hands Home Care have all the necessary training to work with these situations calmly and compassionately. We work to create a safe, structured environment for our clients so they feel secure, are less likely to wander, and are less likely to become agitated. We can also help with daily activities like bathing and dressing, as well as incontinence. Companionship and Conversation. One of the first symptoms for patients with these conditions is problems with their short-term memory. Our caregivers learn about their clients’ backgrounds and interests so they can have meaningful conversations that will help build solid relationships, as well as trust. Memory Building Activities. Our aides will work with your loved one on memory building and physical activities that will stimulate their brains and may help slow the progression of their diseases. Personal Care Plans. We’ll work with you to create a personalize care plan that addresses all your loved one’s personal, physical, and mental needs and keep you informed of any changes in their condition. Dignified, Compassionate Care. All of our caregivers have received specialized training, so they can provide the care Alzheimer’s and dementia patients need and deserve. We treat all our clients with dignity and respect and work to help them feel safe and secure at all times. It’s difficult for family members to provide the level of care that dementia and Alzheimer’s patients need on a daily basis to keep them healthy, safe, and comfortable. The caregivers at Assisting Hands Home Care can provide clients in Des Plaines, IL with in home care and memory care services that allow them to stay in the comfort and privacy of their own homes, with the items and furnishings they remember. For more information about our memory care services or to schedule an appointment, call our care coordinators at (847) 915-6186.